This game has a new feature called walking wilds which you will find in the main gameplay of this amazing game When a wild symbol is placed on the reels it will travel one reel at a time until it leaves the left most reel, hence the name walking wilds! There are also in game free spins, where the main feature is to collect keys to unlock the different wild functionalities. 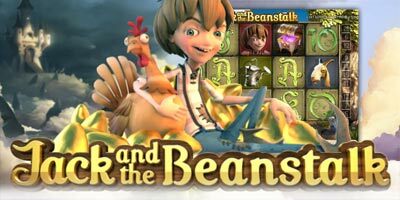 • Jack and the Beanstalk is a 5-reel, 3-row video slot that features Treasure Collection in Free Spins, and Walking Wilds with re-spins. • Play 20 fixed bet lines at different bet levels and coin values. The spin button plays the game at 20 bet lines, the current coin value and bet level (alternatively, press the spacebar). • MAX BET plays the game at 20 bet lines, highest bet level, and the current coin value. • Alternatively, click any symbol on the reels during the main game to view a mini paytable for that symbol. • Wild symbol substitutes for all symbols except Scatter and Key symbols. • Wild symbols substitute for the highest possible winning combination on a bet line according to the PAYTABLE. • In the main game, Wild symbols appear on reels 2, 3, 4 and 5. • During re-spins, Wild symbols appear on reels 2, 3, and 4. • The key symbols are only available on reel 5 in Free Spins. • Only the highest win per active bet line is paid. • Game History is not available in PLAYING FOR FUN mode. • COINS displays the number of coins the player has available to wager. • Coin wins on Scatter symbols are added to any bet line wins. • Wins pay on selected bet lines, except for Scatter symbols. • 3 or more Scatter symbols appearing anywhere on the reels activate 10 Free Spins. • 3 or more Scatter symbols during Free Spins activate 5 additional Free Spins. • Free Spins are played at the same bet level and the same number of lines as the round that activated Free Spins. • Free Spins and the Walking Wild feature can be activated in the same game round. If this occurs, Free Spins is played first, followed by the Walking Wild. • All Free Spins wins with Wild symbols pay coin win x3. • When a Wild symbol appears on the reels, a re-spin is awarded. • During the re-spin the Wild symbol moves one reel to the left with chances of more winnings. • Re-spins continue as long as a Wild symbol is present on the reels. • The Walking Wild feature appears both in the main game and in Free Spins. • When a Wild symbol appears during Free Spins, the Free Spins stops and the Walking Wild feature becomes active. The Free Spins continue after the Walking Wild feature ends. If additional Walking Wilds appear during re-spins, the re-spins will continue until the last one has reached the leftmost reel and the following spin does not contain any Wild symbols. Collect 9 key symbols, and the next Wild appearing on the reels will become an Expanding Wild with a golden harp symbol. The Wild expands to cover the entire reel, and shifts for a chance at bigger wins. At the end of Free Spins sessions, all the symbols collected are discarded. Once you have collected 9 key symbols, and there are no more Expanding Wilds present on the reels, the game returns to the main game. *A Stacked Wild is a Wild symbol that covers 2 or 3 positions on the reel. Stacked Wilds may be fully or partially displayed depending on how the reel lands. When a Stacked wild symbol appears on the reels, a re-spin is awarded. During the re-spin the Stacked Wild symbol moves one reel to the left until it reaches the first reel, after which the re-spin stops. The Scatter symbol does not appear during re-spins, so it is not possible to win additional Free Spins. "Jack and the Beanstalk video slot * How To Play * Demo * Free Spins"